You can create slicers by dragging fields to the Slicers tab or through the context menu of a field. When you create a slicer group, it appears on the Slicers tab, as shown in the following image. You can use slicers to dynamically filter reports at design time in InfoAssist. You can dynamically filter reports at run time when they are included in an InfoMini application. For more information on InfoMini, see Building InfoMini Applications. Click the New Group button to create a new slicer group. Select a field from the Data pane and drag it onto the Drag Fields Here to Create Slicers text on the Slicers tab. Note: You cannot drag parent-child hierarchies onto the Slicers tab. The field is added to the new group. Right-click a field in the Data pane, point to Slicers, and then click New Group, as shown in the following image. The field is added to the new group, as shown in the following image. If you are creating a slicer on a full date field, a calendar icon displays adjacent to the field, as shown in the following image. You can use this icon to select a date using a calendar control. Select a field from the Data pane and drag it onto an existing slicer group. 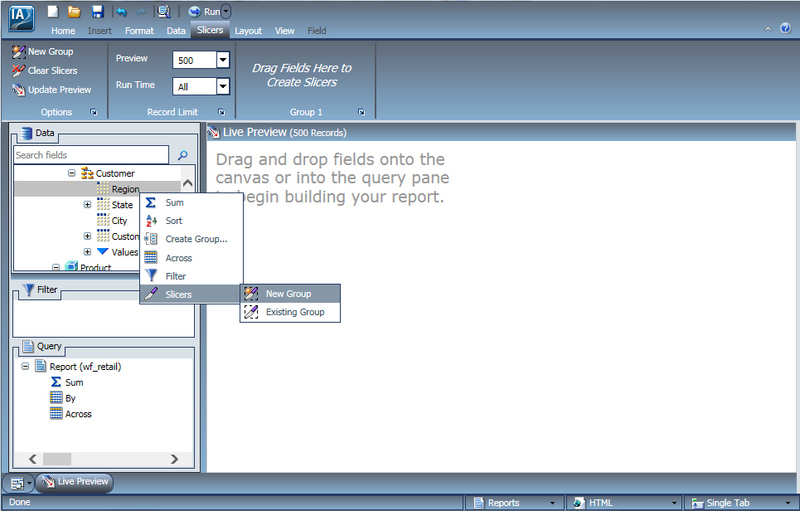 Right-click a field in the Data pane, point to Slicers, and then click Existing Group, as shown in the following image. Select an existing group from the menu, as shown in the following image, and then click OK. The field is added to the existing group. Select a hierarchy from the Data pane and drag it onto an existing slicer group. The hierarchy is added as a new group, not as a slicer in the existing group. The new group is given the same name as the hierarchy. Select a hierarchy from the Data pane and drag it onto the Drag Fields Here to Create Slicers text of the Slicers tab. The hierarchy is added to the new group, as shown in the following image. The name of the new group changes to the name of the hierarchy automatically. Note: Hierarchies cannot be added to existing slicer groups. If a hierarchy is dragged onto an existing slicer group, a new group is created automatically. There is no right-click context menu for hierarchies. To add a hierarchy as a slicer group, you must drag it into a new slicer group.